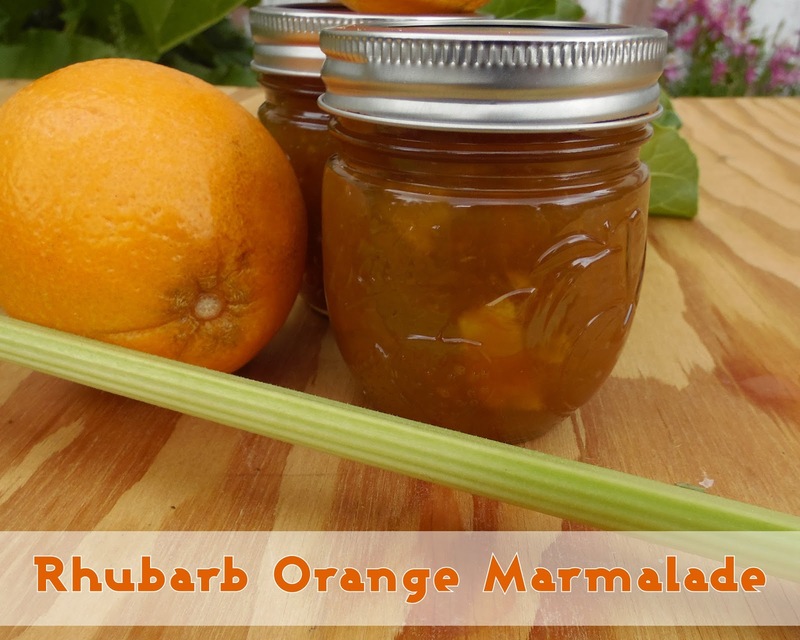 So this marmalade came into being because we have a LOT of rhubarb. Last year, at the beginning of spring, my husband and I split our plant into 8 smaller plants. We gave away 4 of them, and kept 4. Those divisions were fairly large and now I have 4 huge plants. My rhubarb is green. It's a Victoria-type that's very sweet, very tender and tends to have thinner stalks that get very long. The bottoms are red, but the lengths are a celery green. Those oranges are fairly large oranges. There are a lot of recipes for orange-rhubarb marmalade on the internet. They call for various cooking methods and varying amounts of the ingredients. Sometimes they have nuts or spices in them. Our recipe is fairly simple, but it's really tasty. My daughter did the cooking. I did the harvesting and gave her the recipe. Wash your fruits. Anything that you grow yourself and you know what gets on it, you can decide how best to wash it. For oranges from the store, wash with a bit of soap and water. 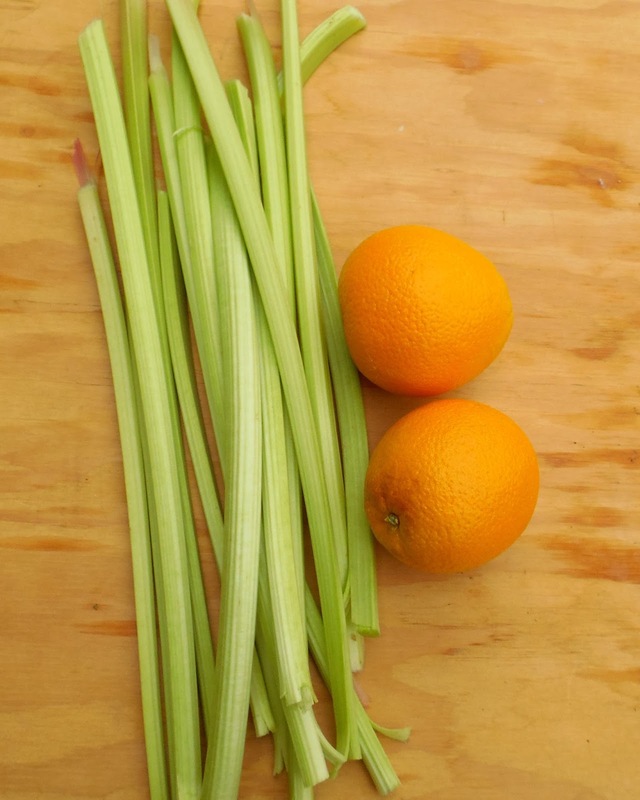 For store bought rhubarb, dunk it in 1:4 vinegar water mix, scrub lightly, then rinse. Zest the oranges into a bowl using a paring knife, microplane or vegetable peeler. After that, cut the orange into quarters, and cut off the peel and pith. Then cut the quarters in smaller pieces and put them in the bowl. Cut the rhubarb into half inch pieces. This might require cutting them in half length-wise then chopping them into smaller pieces. 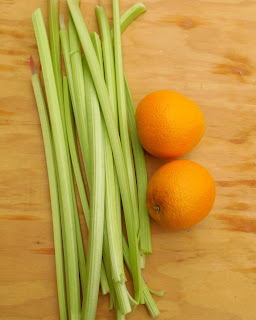 Put the rhubarb, oranges, sugar and water into a heavy bottomed 5 quart pan and bring to a boil. Turn it down and let it simmer for about an hour stirring frequently. It will thicken. Check it by lifting the spoon, when it sheets off the spoon, it's ready. While you're doing that, prepare your jars. We used a combination of 4 oz jars and those gorgeous Ball Canning Elite Jelly Jars that are in the photo. Fill the jars leaving a 1/4 inch headroom, remove bubbles, wipe rims and process jars (hot water method) for 10 minutes. This makes a lovely, tart and sweet marmalade that is delicious on pancakes according to my daughter who is eating some just that way right this moment. Me? It's hard not eating it just by the spoonful, but I'm looking forward to trying it on chocolate ice cream.